So laid back.....nearly forgot you all. How could we pass this lot just south of the Buckby flight without getting the chainsaw out. It has all been laying there for quite sometime after the good stuff was sold. It will probably be there for quite a while. I cut, Jaq helps carry it back to the boat. What a team. .Well things on board nb Valerie have become very relaxing lately after all the hassles of banks, NI number for Jaq, joining a doctors surgery, and other pressures. As of the last couple of weeks we have slotted into what i have always known as a boaters way of life with no particular place to be at any set time. When we left Norton Jct. by the Leicester Arm we allowed ourselves a week, a day would have been enough, to get to Napton for a w`end visit with friends Andy & Tina . At the moment we are just 3miles out of Braunston and this is our 2nd stop in those 3miles, just because we fancied it. So as i sit typing, the smell of fresh bread cooking and the lambs playing opposite are my only distractions. I have always been fascinated by the twisting route of the North Oxford (straightened in 1830) and have been doing a lot of walking across fields seeking the old route. 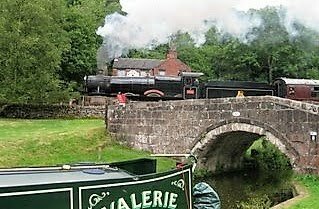 I would think the part around Braunston is well known to regular boaters who like to walk but I have posted a Google map below of what is a very interesting walk that passes a lot of the old route. The Nicholson guide does show some of the old water channels but you need good eyes to notice it. A.....Bridge 97. Here can be seen 2 sections of the old canal route still in water. C......The original Oxford heads off across fields to avoid the low land of what is now puddle banks. D/E...The footpath crosses 2 in water sections of the old canal route. F.......The footpath from bridge 91 having at this point passed the church. 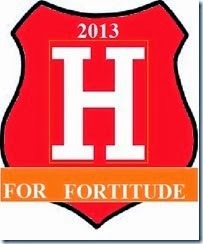 G......The new rote of the Oxford. After crossing the bridge either turn left to find C easier and also to trace the old, now dried out, route as it makes it`s way to A (brdg 97) or go down onto the towpath back into Braunston. where the canal came across the field and became a crossing point of the railway. Just 50yds or so before the bridge is a clump of trees growing in the old bed where it leaves the canal as is now. Just past brdg 83 if you look carefully you can again see the old and new meeting. It`s just a matter of the new route being in a cutting so each end of the old route is where the land levels out. Another place with no climbing through trees is from brdg 78. Walk along the road on the Barby village side and the old canal butts up to the road on the first bend. You can get into the field as you come off the bridge by following the footpath sign. To follow it along is by the stile to the left and a muddy trek up and down muddy hills. If you look on google satellite maps you can see this section has been added to for fishing but the main channel is clear enough. It comes back across the current canal just past the motorway bridge then goes off west across the fields then turns and goes right through what is now Barby Marina. Anyway hope someone as well as myself finds all this of interest. I`m going to be walking a lot as we travel to find other parts of the old route. It ended up about 20 miles shorter so there is still plenty to find. Halfway up the flight and we meet up with Graham off nb Matilda Rose out dog walking. Jill was away so perhaps on the way Jill we might get a chance to say hi. Thing is Graham walked past me at a lock turned back and said "I recognised Jaq First" Thanks for your help up the flight Graham. 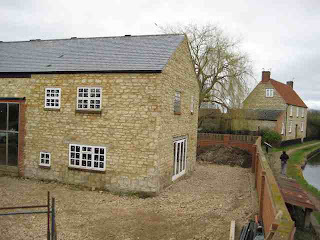 Nice to see the building next to Blisworth Tunnel is now in use as a Blacksmiths. The building was once a forge and stores for the tugs that used to pull boats through the tunnel. The steam tugs operated between 1871-1936. The charge was 1/6d (7.5p) laden and 1/- (5p) for empties. Leggers were made redundant. It seems the congestion caused by the slow legging of boats was eased by the tugs that would pull a string of boats through quickly. Some legging pics on this site for those who are wondering especially Jaq`s USA friends & family who i know read the blog. Look at this from the web.. The whole article is HERE. These guys after so many years legging must have had some good leg muscles. 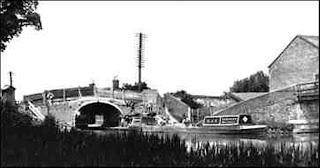 26.4.1871 Mr Mercer reported that a tug was now at work at the Braunston Tunnel and that the same charges were being made at the Blisworth tunnel, viz: Boats with cargoes of 25 tons and upwards 1/6d each way. Boats with cargoes under 25 tons 1/3d each way. Empty Boats 1/- each way. And as the service of the leggers (twelve) would no longer be required it was resolved that a weekly allowance of 5/- each be made to W. Benjamin 75 years of age and 44 years at tunnel; R. Thomas 65 years of age and 38 years at tunnel; and John Fox 64 years of age and 19 years at tunnel." First lambs of 2012. They are there click the pic. These were on the Braunston Summit just after leaving Norton Jct. the branch to Leicester. The Newport Pagnel arm left the Gd. Union or Gd. 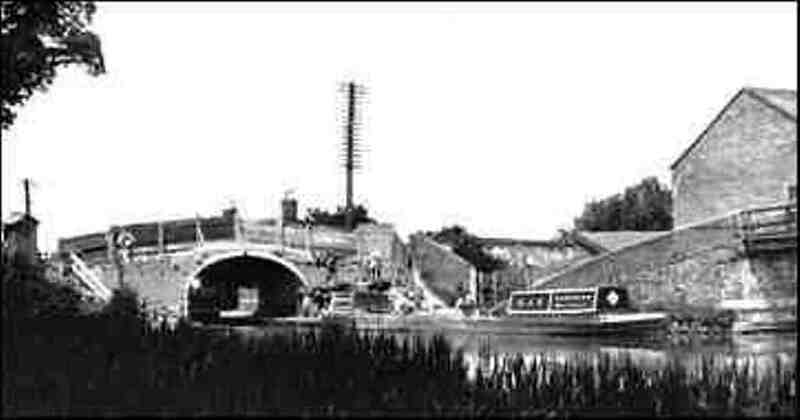 Junction as it was in 1817 at Linford Wharf adjacent to bridge 77. There was once a wooden bridge across the arm. Opened in 1817 it had 7 single locks on it`s 1 1/4 miles journey into Newport Pagnel. The railway purchased the arm in 1864 with a view to using part of the canal bed for the rails into N. Pag` with thoughts of future extensions to Olney & Wellingborough. The line was busy carrying workers to the Wolverton railway carriage works, 3,500 workers in 1877, and had stations at Bradwell and Gt. Linford. The line finally closed in the 1960`s. Interesting that the present Wolverton station on the east of the canal at bridge 71 is the 3rd station site owing to expansion of the works over the years. A lot of the carriage sheds have been converted to housing and light industry retaining the old shells of the buildings. Sadly some have given way to new development and as you cruise by the old walls seem to look across the water with superior airs at the new builds. Wolverton works link HERE but i like this BLOG especially the comments. Looking across from the winding hole on the south side of brdg.77 the entrance is quite clear and the warehouse on the left above and the right in the picture below was used in the last war to assemble tractors that arrived by boat on their journey from USA. The wooden bridge can just be seen in the picture below. 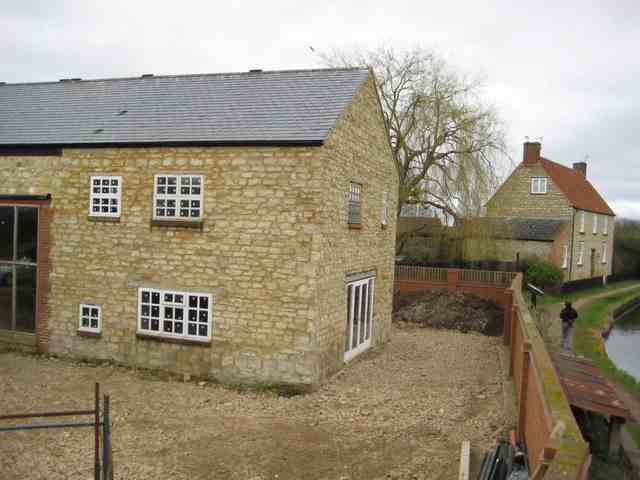 in late 1700`s now GradeII listed and sells for around £800,000 according to records i found. The warehouse is now a really beautiful conversion(old pic) and i would guess the asking price would be similar to the old pub. Looking from the rear the old pub is out of shot to the left and i am standing where the canal once flowed. Immediately to my left is the lock cottage below. The lady in the picture was on her way to feed the ducks was a pleasure to talk to. She told me her garage, the white building, was subsiding as it was on top of the lock chamber. Just follow round past this garden to the left and the bed of the old canal is there to see. The platform of Gt. Linford station can be seen from the road just a short walk from the canal bridge. The line crosses the canal on it`s way to Wolverton at brdg.76a. I know Jaq and I were in America for most of the summer in 2011 but we did hear of the lack of rain but I for one didn`t realise how bad things were until we started our trip south to London. Marsworth reservoirs then were the lowest I had seen in 6yrs. The lack of water in places approaching the summit coming back from London and the further detioration of the reservoir levels plus tragicaly low pounds leaving the summit through Ivanhoe and Slapton made the journey hard going at times. At lock 33 BW were putting water into the next 2 pounds to enable us to float down the centre. The first pound was ok but coming out of lock 32 I run aground mid channel just managing to slide off a mud bank a boat length out of the lock mouth and had to creep along the rest of the shallow pound to lock 31, after this things improved. Having seen this at first hand it was no surprise when BW issued the notice below although they have now added a few days to enable boaters to get out of the section or remain grounded for however long it takes for levels to improve. Due to ongoing extremely dry conditions and to protect very low reservoir stocks - we will be lowering the operating levels of the Tring summit by 300mm from Wednesday 11th January 2012 (am). Whilst the volume of water required for lock operations is low this time of year, a feed from the reservoir group and from groundwater sources has still been required to maintain the canal at the normal operational level. The current demand on reservoirs and groundwater sources will, if maintained, increase the risk of having depleted water resources during the 2012 main boating season. The above section will be CLOSED to through traffic and moored boats* from Wed 11th Jan(am) until further notice. Reduced operating levels (300mm min) will not allow boats to safely moor or navigate the section. A short section at Cowroast will be contained at normal levels through the implementation of stop planks (between Lock 46 and New Ground Bridge, no. 136). This will afford stability (although immobility for moorers at Cowroast long term site and the marina). The 2 locks (Lock 39 & 49) will be locked throughout, as others may be within the affected area to avoid losses through misuse. Aylesbury Arm, will continue to be locked against navigation and open to essential traffic only. The operating levels of the Arm itself will be subject to further review and the aim of 'bulk' movement of essential boat traffic will be the aim to reduce lockage. Additional local arrangements will be in place with Bulbourne dry dock to facilitate a restricted occasional access. This was the pound north of Fishery lock Hemel. This is the pound leading up to Rising Sun Lock in Berko. This is between Gas Locks Berko after I started putting water in to fill the lock nb Valerie was in behind where i`m standing. Poor Jaq at the helm had no idea why the boat wasn`t rising even after she saw me raising the paddles. I then went up to let water down and came back to let her know what was happening and to keep centre channel. Startops reservoir Marsworth and the level is much worse than on our October southbound trip. This un-known location is north of Marsworth and the other photos I took on this section seemed to have been wiped from the laptop. Don`t ask, just put it down to old age. Thinking things over I`m glad we decided to go into London when we did. Thanks to Del & Al for saying just go for it and if it freezes so be it, you guys were right so close it would have been daft not to do it and thanks for the tip on the theatre site. I see we have just missed meeting again as we are below Buckby and not following your route after Braunston. Like to say hello to bloggers NB Chance who passed us today. Also another reader Ross aka Bert the Gnome, I have e mailed you Ross. This is the link to the abandoned boats at Marsworth post mentioned at the end of the last post. It was March 2010 when I first read about sunken boats at Harefield and only now 20months later have I managed to stop, Jaq had called a lunch break, to have a look. 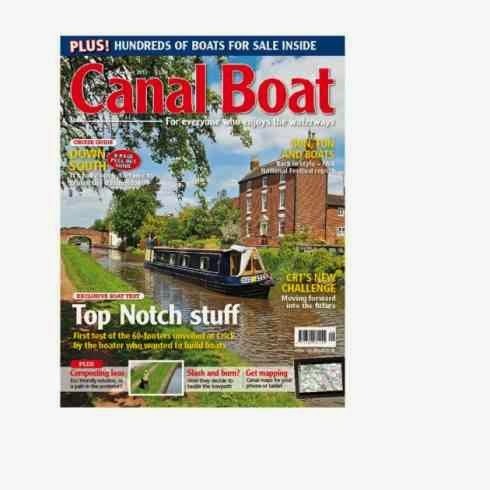 The link to a post on Canal Forum is some 11 pages but is well worth a read if like me history of the canals is your forte. The water level is down and some of the boats are showing. If I had spent more time searching the whole area I would for sure have found more but you do not let Jaq`s lovely lunches go cold. It seems the boats were floated in via what is now Harefield marina through a man made gap into the old Quarry. The gap was then filled in and the large number of boats have remained there since the early 1960`s. This page on the forum gives an idea of how many boats are there, SCROLL down to the aerial picture that has the overlay as I can`t get a direct link to the piece. So maybe this is the answer to un-licenced boats, into one of the many old flooded quarries for say 1 month then sunk if no licence is obtained. spotted. The removal ship moors in front, stop planks removed to sink removal ship, float in narrow boat. Planks in pump out water and off it goes. NOW the big question is go where?. Don`t worry I found how this was dealt with some 50+ years ago just a bit further along the canal.